Vīrabhadra is an emanation of Śiva, created to wreak havoc on Dakṣa’s sacrifice. Dakṣa was the father of Śiva’s first wife, Satī, who objected to their union because of Śiva’s constant attendance at cemeteries and burning grounds, as well as his appearance, smeared with ashes and unkempt hair, and his wild hair. Unable to prevent Śiva’s marriage to Satī (Pārvatī, in another version), Dakṣa planned a great sacrifice to which he pointedly did not invite Śiva. When Satī’s pleadings that he should not dishonour her in this way were ignored, she leapt into the sacrificial fire and was consumed by the flames (hence the name given to the rite where Hindu widows threw themselves on to their husband’s funeral pyre). Śiva, distraught with grief and fury, wreaked terrible destruction on the sacrifice and in the process cut off Dakṣa’s head. Eventually Śiva repented and brought Dakṣa back to life, but his head could not be found, and a goat’s head was substituted for it. Hindu myths indeed rarely have an unhappy final outcome; disastrous occurrences are as often as not remedied by one or other of the gods although, perhaps influenced by the Indian cyclical view of time, a further episode is always possible. Images of Vīrabhadra and temples dedicated to him are particularly common in Andhra and Karnataka. Here he stands in a curious pose, his weight evenly distributed on both legs, slightly bent at the knees and with the feet wide apart. He holds a trident in his rear left hand and a shield (kheṭaka) resting on a human head (presumably that of Dakṣa) in his lower right. This is in accordance with the prescriptive texts. 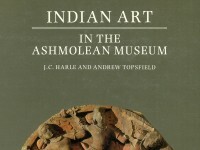 His lower right hand is clenched so as to hold a removable object (here missing), most likely a bow or arrow or a sword (khaḍga). 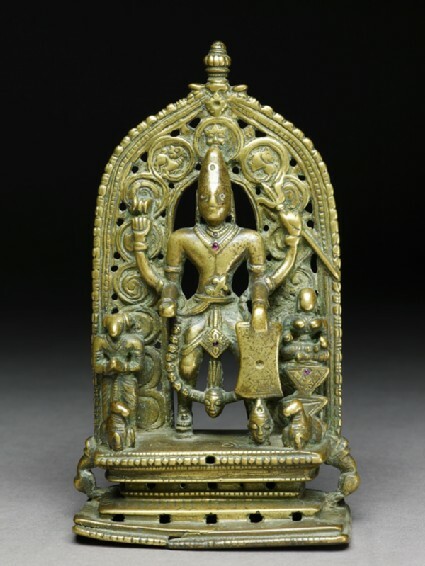 In his upper left hand he holds what may be a ḍamaru (a word of Tamil origin for a small hour-glass shaped drum, common in the iconography of the Tamil region, but apparently not mentioned in the texts as an attribute of Vīrabhadra). The sandals, with a projecting knob gripped between the big and first toe, are associated in Tamiladu with Śiva as ascetic and mendicant. Vīrabhadra is an ugra (wrathful) aspect of the god, as indicated by the long wreath of skulls (muṇḍamālā) reaching down below his knees and the head hanging down on a long cord from his waist. This could conceivably represent a strand of hair, Vīrabhadra having been created, according to one version of the myth, from Śiva’s matted locks. The curved sword, here stuck into Vīrabhadra’s belt, is also one of his common symbols. He wears a tall mukuṭa (much rubbed, like his face). His eyes are inlaid with silver and there are individual inlays of very small rubies, many of them missing. On Vīrabhadra’s right stands Dakṣa, with a goat or sheep’s head and his hands held in añjali. On his (proper) left sits the small but carefully modelled female figure of Bhadrakālī, by one account the leader of Vīrabhadra’s armies. She sits atop two (three?) superimposed inverted triangles whose significance is not clear. Two little couchant Nandīs [see EAOS.77] occupy the outer corners of the base, which is of some complexity. There is a fine prabhāmaṇḍala (aureole) with the typical vegetal scrolls winding up on either side, the three top circles enclosing a lion, a kīrtimukha (lion mask, lit. : “face of glory”) and a yāḷi, a mythical animal commonly depicted in later Indian art, sometimes called a leogryph in English. The outermost band of the aureole, a sort of bead and reel, springs from the mouths of two small animal figures, their front paws propped on the top ledge of the base. The back of the aureole is also decorated with incised patterns. 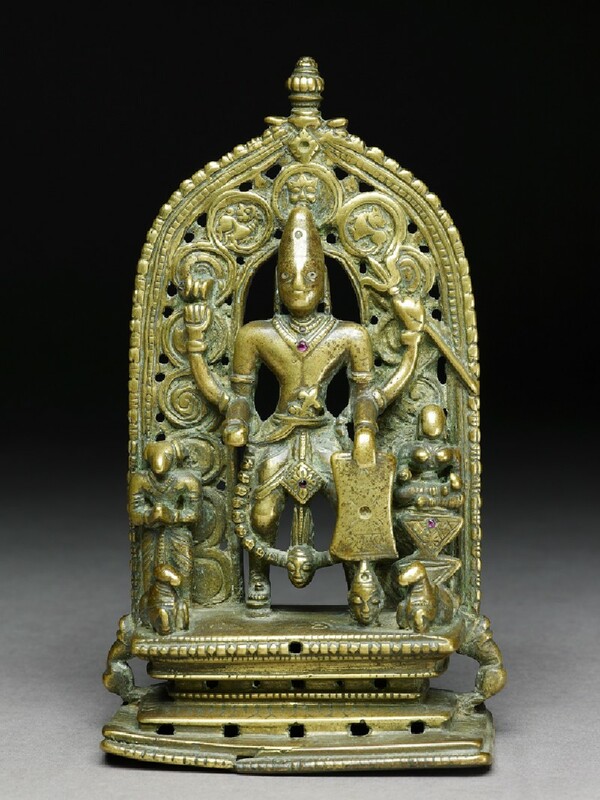 Metal sculpture from the Deccan is relatively rare and this image has the added interest of being inscribed in Canarese characters of the 16th–17th centuries. The inscription reads: Devabhāṇu mādi dānu: “Devabhāṇu made me”. The name Vīrabhadra simply means “distinguished hero”.